So if you're reading this post on or around July 20, you've been directed to this blog shortly after its official launch--probably by one of the bands involved in this project. So hey! Hi there. Welcome to UNINTIMIDATED. If you're wondering what the hell this project is, i explain it in a fairly high-level manner in this post, also permalinked in the "About the Project" link over on yonder right. But hey, we're building content over here, and this is the first day i've made this blog public, so let's talk more about why we're writing anti-Walker protest songs and performing them live in a recording studio in August with the intent of releasing said performances on a live, in-studio CD and DVD. Back in 2011, my band IfIHadAHiFi recorded and released a protest song during the Madison Act 10 protests. 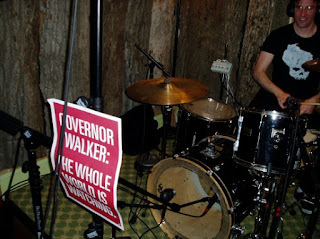 That song was "Imperial Walker," and the $1 Bandcamp downloads of the track raised over $500 that we donated to Russ Feingold's Progressives United PAC. That song and project were born out of a sense of helplessness and desire to accomplish something while proud, hardworking Wisconsin citizens were having the right to collectively bargain stripped away. See, it's really easy to resign yourself to Internet slacktivism--the idea that the best and only course of action in response to enraging political activity is to share an article about it on Facebook, get a bunch of "likes" and maybe a couple shares, and go about your day, satisfied that you got to express your outrage, and leave it at that. But when day after day produces a new outrage--the idea that a minimum wage is a "lame idea," a certainly unconstitutional ban on abortions after 20 weeks, a corrupt State Supreme Court halting an investigation involving political advocacy groups that have donated money to those same justices--it's harder and harder to stand by and simply share outraged articles with clickbait-crafted headlines. 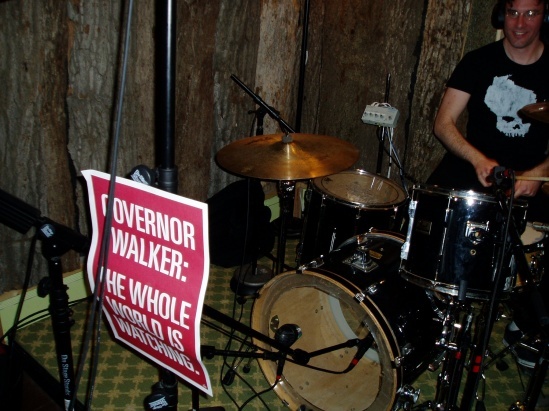 So yeah, a bunch of Wisconsin bands are going to write angry, pissed-off songs about our rotten, corrupt governor (who is running to become our rotten, corrupt President--hence the timing of this project), and raise money for a worthy cause. We'll be announcing that cause soon, but be assured of one thing--it will not be the Democratic Party of Wisconsin. This is a non-partisan project, and frankly, the way the Wisconsin Democrats have performed in recent years (running Tom Barrett twice? Running a centrist businesswoman in Mary Burke and expecting her to win over fanatical conservatives statewide? ), we don't trust them with the proceeds. The money we raise will directly assist people feeling the brunt of Scott Walker's economic policies--people like you and me. Don't get it twisted--we realize that a few angry protest songs won't change the state by themselves. This record isn't going to force Walker out of office or convince anyone in Waukesha to rethink their alliances. But hopefully our project is one of several that spring up across the state to spread information & awareness, fire people up, and encourage people to DO SOMETHING. Volunteer for a progressive candidate for local office, fundraise for progressive causes--hell, even just start a civil dialog with someone across the aisle politically. As artists and musicians, we feel like we have to do something to let people know that Wisconsin isn't just rolling over and staying quiet while the Republican party destroys transparent government and makes the lives of working-class Wisconsinites more difficult while lining the pockets of special interests and power-hungry millionaires and billionaires. We're humble, working-class punk rockers. We all have day jobs. We pay taxes and we contribute to society. But because we have to work for a living, we don't have a lot of extra time to devote to the fight. It's hard to work for something bigger than yourself when you have a responsibility to provide for yourself or your family. But we're musicians, and we can at least do this, and hopefully inspire more activism in Wisconsin. Isn't that what all the best protest music does--inspire? Hopefully we inspire you too. What will you do to help win our state back? Doing an interview with WORT Tuesday, i guess! OK, so we're on social media finally. Waukesha Republicans are Creepy as Hell. We're bringing protest back to punk rock.